Enter a plane filled with deadly perils and priceless treasures. On Zendikar, mana works in ways never before experienced. This mana is Zendikar's unique treasure, one that planeswalkers from across the Multiverse risk their lives to acquire. Dare to join them. Zendikar is a world of adventure and reward for those with the courage to brave its perils. Learn the value of allies, complete quests, set traps (and avoid them), and take advantage of landfall and kicker as you confront Zendikar's hostile environment. 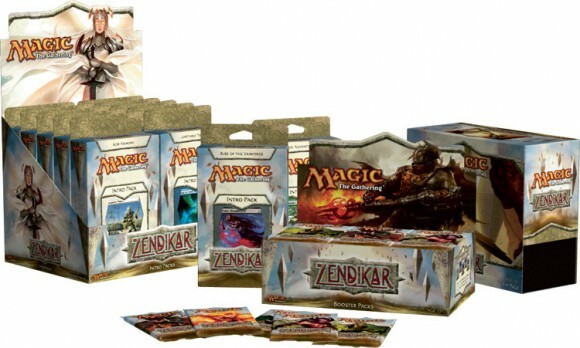 Zendikar is a new world for Magic: The Gathering, and is the first set in the Zendikar block. The set features 249 black-bordered cards, including randomly inserted premium versions of all cards in the set. It will be available in booster packs, intro packs, and fat packs. The set features new planeswalkers, including Nissa Revane, the popular face of the Xbox LIVE® Arcade title Duels of the Planeswalkers™. The set introduces the new mechanics landfall, Allies, Traps, and quests. Zendikar also features a returning favorite, Kicker. Zendikar booster packs and fat packs will include stunning full-art land cards created by some of Magic's finest artists. What can I say? I love Zendikar for Allies, who are probably my favorite tribe in MTG (Slivers are close second), for Quests…well, for everything. New mechanics are easy to learn and use, but still have room for more refined, subtle applications. 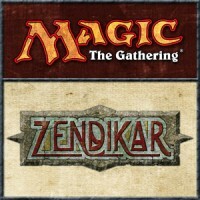 Add a Review for "Magic: The Gathering – Zendikar"